The five most popular CNN.com stories during the last 24 hours, according to Newspulse. week's attacks on a religious minority, authorities said. officers and a security guard were killed. President Barack Obama cut short his Memorial Day remarks Monday in Elwood, Illinois, telling people to take shelter in their cars due to a heavy storm. - The U.N. Security Council held an emergency meeting Monday called by Turkey in response to the incident. - On Monday, Israel insisted its soldiers were defending themselves when they opened fire. "They deliberately attacked soldiers," Israeli Prime Minister Benjamin Netanyahu said of the activists. - In Iraq, hundreds of supporters of radical Shiite cleric Muqtada al-Sadr took to the streets of Baghdad in protest of the Israeli action. - Israeli Prime Minister Benjamin Netanyahu said Monday Israeli soldiers were attacked as they attempted to stop a convoy headed to Gaza to deliver aid. The soldiers were beaten and stabbed, and there was also a report of gunfire, Netanyahu said, appearing in Ottawa, Canada, with Canadian Prime Minister Stephen Harper. Four Israeli soldiers were injured, he said. - Israeli Prime Minister Benjamin Netanyahu has cut short his visit to Canada, and will return to Israel after holding a working meeting with Canadian Prime Minister Stephen Harper to "update him on the recent events," said an e-mailed statement from a spokesman. Netanyahu spoke with German Chancellor Angela Merkel earlier Monday, the statement said. - The Israeli troops "were not expecting to be attacked," said Jonathan Peled, minister-counselor at the Israeli embassy in Washington. He said the soldiers came aboard carrying paintball pistols, but were attacked with knives and metal bars. One naval commando was stabbed, prompting the soldiers to open up with live fire, killing the nine, he said. - The Palestinian Cabinet, in its weekly meeting, "strongly condemned the Israeli crime against international supporters on board of the Freedom Flotilla, which reveals, once again, Israeli disregard to the lives of innocent civilians and its disrespect to international law, norms and resolutions," the Palestinian Authority said in a statement. The wind blast from a Marine Corps tilt-rotor aircraft performing a Memorial Day demonstration Monday caused tree limbs to fall, leaving 10 people injured. According to Lauren Schulz of the United States Marines, the incident, which occurred shortly after 9 a.m. ET at Clove Lakes Park on New York's borough of Staten Island, was part of New York City's annual Fleet Week Exhibition, which includes military displays from the Navy, Coast Guard, and Marines. The death toll from Tropical Storm Agatha is growing, with 123 reported killed in Guatemala, 14 in Honduras and nine in El Salvador. At least 90 people are missing in Guatemala and another 69 are injured, the nation's emergency agency reported late Monday. The previously reported toll for Guatemala was 92 deaths, 54 people missing and 59 injured. German President Horst Koehler resigned suddenly Monday over what he said was heavy criticism about comments he made on Germany's military involvement in Afghanistan, which he said had been misinterpreted. Today, on Memorial Day, we remember the soldiers from all parts of the world and from every U.S. state who have given their lives fighting for their country, More than 1,700 U.S. and coalition troops have died in Afghanistan, according to a CNN count. Take a look at our new special Home and Away to view, remember and post tributes to all of the soldiers, like Pfc. David John Bentz III, whose mother Kimberly Geonnotti is remember him on this Memorial Day. [Updated at 1:02 p.m.] Editor's note: On Memorial Day, this column honors military personnel, some of whom have given their lives during service, as well as those who support them. This weekday feature presents profiles of people whose actions, ideas or beliefs are newsworthy. The U.S. military, family and friends are mourning the loss of Leicht, a U.S. Marine Corps corporal. CNN affiliate KABB-TV in San Antonio, Texas, is reporting that Leicht was the 1,000th American GI killed in the Afghan war. The 24-year-old from Kerrville, Texas, was killed Thursday in an explosion while on foot patrol in Afghanistan, according to the station. 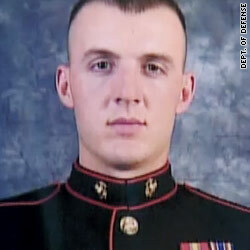 Jonathan Leicht, the Marine's brother, told the TV station that he had only been there for two weeks. Before Afghanistan, Leicht underwent two years of physical therapy after injuries he suffered while fighting in Iraq in 2007. Because CNN only counts U.S. troop deaths inside Afghanistan, the CNN tally of U.S. deaths has not reached 1,000. Other media organizations count war-related deaths in other countries, such as in Pakistan. Gulf oil spill - BP could try to cap a massive oil gusher again early this week in an attempt to solve what the Obama administration has called "probably the biggest environmental disaster we've ever faced in this country." As the spill entered its 42nd day Monday, efforts to clean up coastal areas and develop a new plan of attack continued. All previous attempts to contain the crude gushing from BP's undersea well have failed, including a "top kill" approach that many had pinned their hopes on. 10:30 am ET - Wreath laying ceremony at Tomb of the Unknowns - Vice President Biden attends a wreath laying ceremony at the Tomb of the Unknowns at Arlington National Cemetery. 12:30 pm ET - Obama attends Memorial Day ceremony - President Obama participates in a wreath laying ceremony and makes remarks at Abraham Lincoln National Cemetery in Elwood, Illinois. CNN.com Live is your home from breaking news as it happens. Turkey has recalled its Israeli ambassador after 10 people were killed in a skirmish with the Israeli military while attempting to defy an Israeli blockade and deliver aid to Gaza, Deputy Prime Minister Bulent Arinc said.